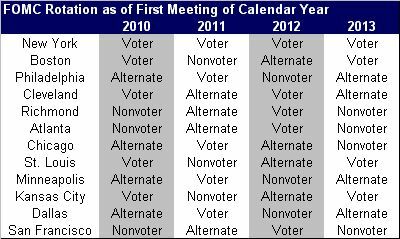 The Federal Reserve’s Open Market Committee changes dramatically in 2012. Gone are Evans (the most dovish member of the FOMC), Fisher, Plosser and Kocherlakota (the Trio of hawks) and in comes Lacker, Pianalto, Lockhart and Williams. Three hawks and one dove will now be replaced with three doves and one hawk. We can only imagine what this means for monetary policy in the coming year. Every piece of good data will be looked at with skepticism and the central bank as a whole will be more introduce another round of quantitative easing than to normalize monetary policy. Jeremy C. Stein and Jerome H. Powell have been nominated by President Obama to fill the 2 vacant seats on the Federal Reserve’s Board of Governors but they still need to be confirmed by the Senate who do not return to business until Jan 23rd.